आनी सोदैव तुजो पुत जेजू. विनती कर आतां आनी आमच्या मरणाच्या वेळार. The Hail Mary, also commonly called the Ave Maria (Latin) or Angelic Salutation, is a traditional Catholic prayer asking for the intercession of the Virgin Mary, the mother of Jesus. In Roman Catholicism, the prayer forms the basis of the Rosary and the Angelus prayers. In the Eastern Orthodox and Eastern Catholic Churches, a similar prayer is used in formal liturgies, both in Greek and in translations. It is also used by many other groups within the Catholic tradition of Christianity including Anglicans, Independent Catholics, and Old Catholics. Some Protestant denominations, such as Lutherans, also make use of a form of the prayer. Based on the greeting of the angel Gabriel to the Virgin Mary in the Gospel of Luke, the prayer takes different forms in various traditions. It has often been set to music, although the most famous musical expression of the words Ave Maria by Schubert does not actually contain the Hail Mary prayer. The Hail Mary is the essential element of the Rosary, a prayer method in use especially among Latin Rite (Western) Catholics. The Eastern Catholic Churches say a similar version of the Hail Mary. The Rosary consists traditionally of three sets of five Mysteries, each mystery consisting of one "decade" or ten Ave Marias. The 150 Ave Marias of the Rosary thus echo the 150 psalms. These meditate upon events of Jesus' life during his childhood (Joyful Mysteries), Passion (Sorrowful Mysteries), and from his Resurrection onwards (Glorious Mysteries). Another set, the Luminous Mysteries, is of comparatively recent origin, having been proposed by Pope John Paul II in 2002. Each of these Mysteries is prayed as a decade (a unit of ten), consisting of one Our Father (Pater Noster or The Lord's Prayer), ten Hail Marys, and one 'Glory Be' (Gloria Patri) (Doxology). 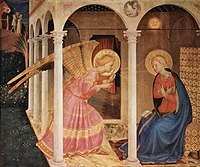 The Hail Mary is also the central part of the Angelus, a devotion generally recited thrice daily by many Catholics, as well as some Anglicans and Lutherans.